In September 2017, the BSA Women in Design and BSA Women’s Principals Group teamed up to create a mid-career mentoring program for female architects. The program has two goals: to connect a network of peers and provide individual attention to help architects navigate their own leadership journeys. Mentoring has advanced my thinking and perspective throughout my career. Being on both sides as a mentee and mentor, I understand that productive conversations take time and trust. The ability to ask tough questions is invaluable. To advance the conversation, there must also be honest answers. We look for common ground. We look for new ideas. We look to connect. Three months in, I am paired with a dynamic, smart architect younger than I am, but with a great career ahead of her. Our first meeting was a long brunch; our second at a busy coffee shop. We decided that Sunday afternoons work for us. We talk about struggles and opportunities. We work through that elusive concept of balance. I realize that in talking with her, I have to clarify many of my own personal choices. Some I fear I have never even said out loud to anyone else. Like in the teaching process, I confront my own assumptions and patterns—the good, the bad, and the ones I am still actively working on. One of the things we talk a lot about is developing a habit of writing and speaking, specifically making time for the practice and finding one’s voice. I admit it’s hard for me to feel completely authentic when I feel like I have fallen out of practice myself lately. My feminist business book binge over the Summer 2017. Thoughts about self-care and the myth of architecture culture. Some amazing Fall 2017 events that I have participated in. Stay tuned. Writing is on my list… so is reading more. It’s all a process. While at Porter Square Books with my son this afternoon, I came across Ray Dalio’s Princples book. I happened to open up to this page. Improvement is a process. 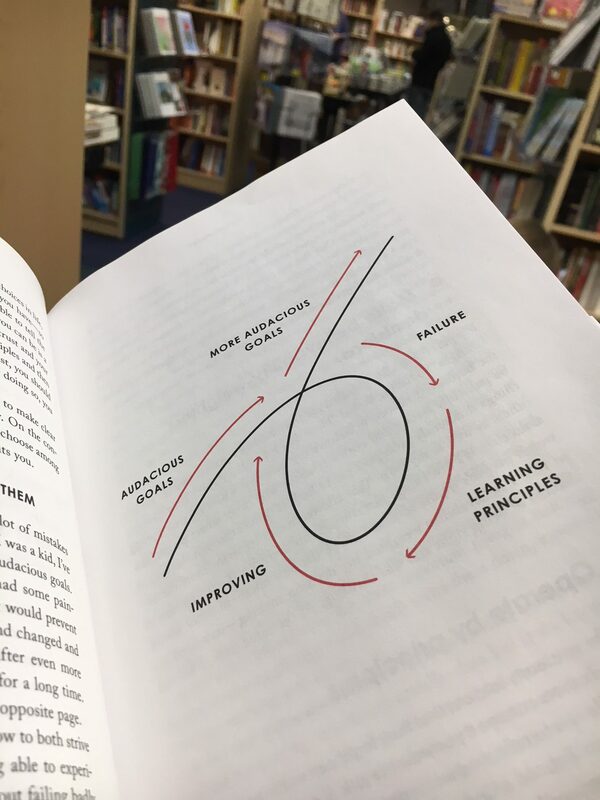 Many times, it is a longer, iterative loop similar to Dalio’s diagram. It starts with a choice, connecting with others, learning, failing, asking tough questions, assessment, choosing again, and ultimately coming up with even better audacious goals. More about the BSA Women in Design Mid-Career Mentorship Program.